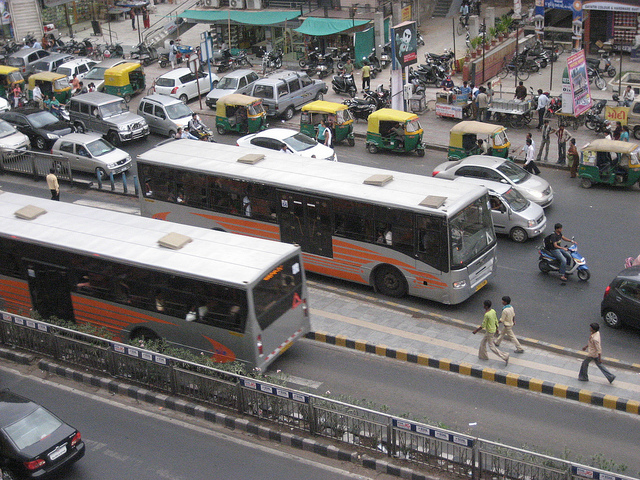 Ahmedabad’s Janmarg is a world-class BRT system. Photo by velaparatodo. The Ahmedabad Municipal Corporation, along with CEPT University, is launching the Asia BRTS Conference to be held on September 6-8, 2012, with the goal of improving knowledge, sharing experiences and advancing the concept of bus rapid transit (BRT) in India and across Asia. Currently, more than 25 Asian cities have implemented BRT systems and bus corridors, with varying degrees of success; and many more are at different stages of planning and implementation. The conference comes at a critical point in the evolution of BRTs in Asia. Recognizing that while existing debates have focused on architecture and engineering, there is a lot to learn from successful cities about engaging stakeholders, branding and communication, network selection, and operations planning. The conference will have local and international experts, including those from the Ministry of Urban Development, the Asian Development Bank, the Clean Air Initiative for Asian Cities, the Latin American Association for Integrated Transport Systems and Bus Rapid Transit (SIBRT), the International Association of Public Transport (UITP), and EMBARQ (the producer of this blog.) The Asia BRTS Association (ABA) will be launched as an international network of Asian cities, transit authorities, operators, policy and decision-makers, technical institutes, and the public transport manufacturing and service industry. More than 140 cities around the world have taken to implementing BRT and bus corridors to help mitigate the growing urbanization, motorization and subsequent congestion of urban road transport networks. BRT systems were developed with the goal of approaching the service quality of rail transit but with the flexibility and cost of bus transit. They are not usually meant to replace heavy rail, but rather, to complement multimodal transit networks. Bus systems provide faster, convenient and more efficient public transport services by building on existing infrastructure, improving the quality of vehicles, and optimally managing scheduling. Bus corridors in cities around the world have been successful because of their quick implementation and relative low cost. Curitiba’s Rede Integrada de Transporte (Integrated Transport Network), which includes the world’s first BRT, currently has a set of corridors of 81 kilometers, transporting 505,000 passengers every day, and Jakarta’s TransJakarta BRT, at a length of 134 kilometers, carries 330,000 passengers every day. Bogota’s TransMilenio is being expanded in 2012 from 87 kilometers to 104 kilometers, and will scale from moving 1.8 million passengers to more than 2 million every day. Currently, the members of SIBRT include representatives from 19 agencies in Brazil, Mexico, Colombia, Ecuador, Chile, Peru, Guatemala and Paraguay, serving a combined ridership of over 20 million passengers every day. Just as the members of SIBRT are committed to encourage innovation, foster efficient and reliable mass transit, and demonstrate how BRT integrated into the wider transportation network of the city can help improve public health, safety, quality of life and economic competitiveness in Latin American cities, it is hoped that the Asia BRTS Association (ABA) would facilitate a pan-Asian forum, that would help cities in the region build capacity, and leverage the exchange of ideas towards technological innovations and the promotion of best practices. Closer to home, Ahmedabad’s Janmarg system has been extremely successful, and has been the recipient of national and international awards. With the current corridor length at 45 kilometers, and an additional 40 kilometers under construction, Janmarg has an average ridership of 132,033 passengers every day. In India, increased urbanization, population growth, the drastic rise in private vehicle usage, and induced demand caused by traditional approaches to improving urban mobility of constructing highways and roads for general traffic, have had significant detrimental effects for cities. Implementing high-quality, safe, fast and accessible bus-based transport, integrated into the urban public transport network, is an important part of improving the quality of life for people in cities. BRT systems, like Janmarg, that include key features like dedicated bus lanes, bus priority at intersections, stations with level boarding and pre-payment, performance and monitoring indicators, and a cohesive communication and branding strategy, will not only improve the efficiency of public transport, but it will also improve air quality, increase physical activity, and improve road safety—all contributing to an improved quality of life. Other Indian bus corridors, like those in Delhi and Pune, have key features missing, which has led to their less than optimal success.